Becoming a GLTF Member is a simple process that can be completed online in less than 5 minutes. All you need to do is fill out our membership application and then pay the yearly fee ( Automatic-renewal memberships are $40/year and manual-renewal memberships are $50/year), either through Paypal or by check. The GLTF is a volunteer-run, non-profit organization (i.e., no one gets paid). Your yearly membership fee helps offset club costs, primarily our insurance policy, which we need in order to reserve courts for our teams and tournaments. Click here to join. So what do you get by becoming a GLTF member? The answer is a whole lot! You will automatically be added to our Yahoo Groups. We have three groups: everyone, women-only, and hitting partners. By sending one email to the group, you can reach hundreds of members. So if you want to play tomorrow, you can use the Yahoo Group to find someone to meet you there. Also, you can search our Member Directory, located online in our members-only section which is available once you log into our site as a current member. You can search for someone you might have met, or you can search for, say, intermediate male players in the East Bay. 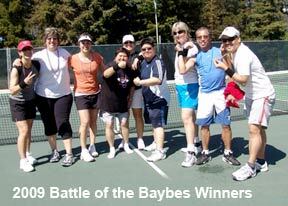 There are several seasons for USTA teams: seniors, adult, mixed, combo, etc. We field teams for them all. We often have 20 teams for Adult Season. The teams vary in skill levels from beginner (2.5) to advanced (4.5). Being on a team is an easy way to get regular play and meet a whole bunch of people. Our USTA Coordinator and Women's Director can help you find a team. Check out our Events calendar to see all the events we host over the course of a year, the proposed dates, and which are social or competitive. Take a look and start planning today. We have more than a dozen competitive events every year. Our biggest event is the USGO, which in recent years has attracted more than 300participants and has been played over Memorial Day weekend at Stanford University's Taube Tennis Center. Other tournaments include Compass Doubles, Club Championships, Legends of GLTF Tournament, Holloran Singles and Sissenstein Doubles, and City Cup. We also have women-only events, such as Ohana Women's Tournament and informal social events. Some of these events are one-day extravaganzas and others are multi-weekend events. We even field teams for Cal Cup, Pac Cup, and West Coast Cup that travel (unless we host!) to cities around western US for an annual weekend tournament. The GLTF also has dozens of non-competitive tennis events per year including World Team Tennis events. These events provide ways for all levels of players to get together, meet new people, and hit the ball without the pressure of competition. Some of these events are also open to non-members. Social Doubles at the San Francisco Tennis Club is the 3rd Friday of every month. We meet on the rooftop courts from 6:30-9:30pm. It's free, fun, and open to members and non-members. Depending on the weather, we usually have about 15-50 members show up. A board member is usually hanging around to meet you and help you get on a court. If you think you might like to test drive our club, this is a good way. Please email the Social Director for more info. The Challenge Ladder is open to all members. It's an ongoing singles competition that plays out over the course of the year. It provides a structure to who you should play but is flexible about where and when. While we do love our tennis, we also have events that don't actually involve playing. We organize trips to see local tournaments, such as SAP Open and Bank of the West Classic. We host a booth at SF's Annual Pride Festival. We also have a year-end Awards Banquet. While the GLTF is not generally in the business of teaching tennis, we do provide outlets for our members to improve. Primarily, we organize a 2-hour, monthly tennis clinic with a local pro. The topics vary and the clinics have limited enrollment, so it's first come, first served. We also have relationships with local pros and can put you in contact with some great folks who support our gay tennis community, most of whom are members. By being a GLTF member, you are often able to get tickets for tennis events at a reduced cost. You will automatically start receiving our official e-newsletter, the AdOut, and regular GLTF Happenings announcements. So basically, we make it very easy for you to get involved, meet a bunch of new people, network within the tennis community, and organize more tennis events than one person could ever possibly play. We're a very welcoming group, we like to have fun, play hard and enjoy some laughs when it's all done. We hope you'll join us. If you would like to know more see our Frequently Asked Questions or email our Membership Director. If you'd like to add your contact info to our database but aren't quite ready to become an official member, please either register for a free event such as our monthly social doubles at SFTC, even if you cannot make the event, or fill out this simple contact form. We'll include you in mailings of our e-newsletter, The Ad Out, and occasional emails for events open to non-members. You can expect about one email per month and you can unsubscribe at any time.